River Reach, a twenty-two acre, private, gated island community is located directly on the New River in the city! Fort Lauderdale is South Florida's most lush and tropical Port-of-Call boasting 3,000 hours a year of sunshine, seven miles of refreshing beaches, and 160 miles of interesting, navigable waterways. Befitting this tropical environment is River Reach. It is a quiet development providing 573 condominium residences, three heated swimming pools, two tennis courts, community center with a well equipped fitness room and on-site professional management. There are efficiencies/studios apartments, one, two, and three bedroom residences. 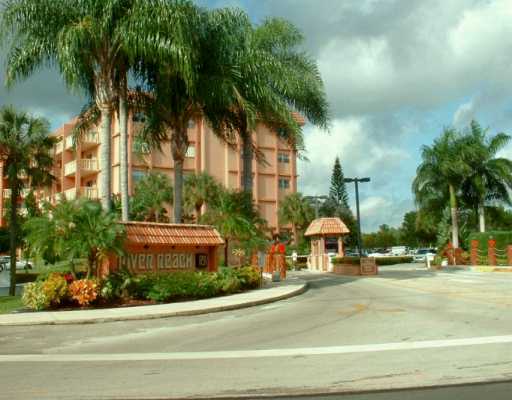 River Reach is minutes from the beach, Fort Lauderdale downtown, the Broward Center for the Performing Arts, Museum of Discovery and Science, Las Olas Riverfront entertainment and the famous Las Olas Boulevard shopping and dining district. It is just minutes to Port Everglades and the Atlantic, and the island offers excellent secure all-weather dockage for the power or sailing yachtsmen. Dockage as available for boats up to fifty feet. Swimming pools, exercise room, tennis, Clubhouse, clubrooms, Barbeque gas grills, Picnic areas, Bike storage and extra storage. There are six buildings in the complex, three pools, and two tennis courts.